Do you have a particular color that you overbuy? For me, I think raspberry pink cremes definitely fall into that category. 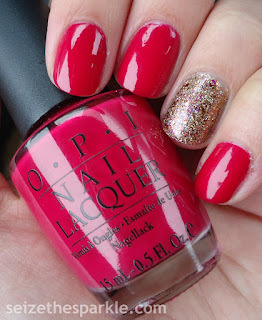 I've got a million of them, but Conquistadorable Color by OPI was one of the firsts in my stash. For today's accent mani, I paired it with the multichrome flaky goodness that is Pahlish Gumdrop Rooftop layered over my favorite gold glitter, Zoya Tomoko. 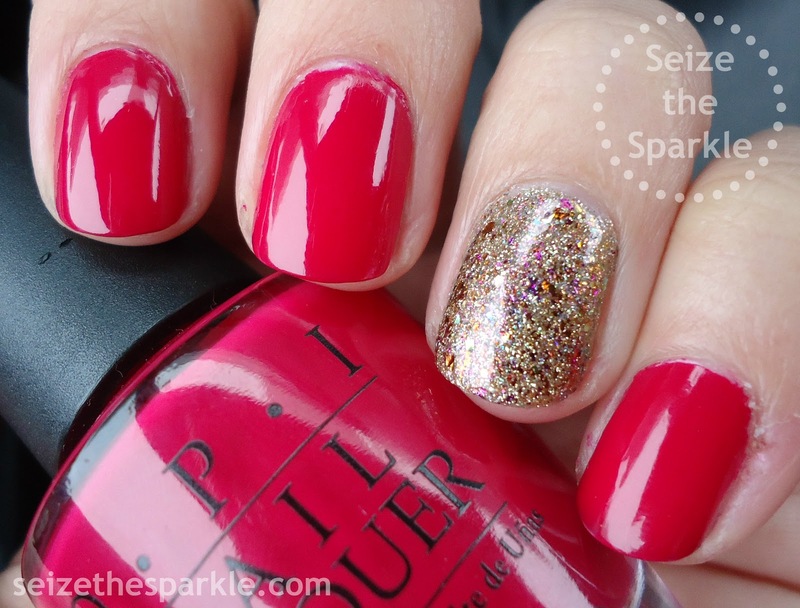 If you haven't heard of this color, it's probably because it was part of OPI's Fall 2009 Collection... Coleccion de Espana. Around that time, I was buying a few OPI polishes here and there, but nothing to the extent of what I buy today! In the photos, you can't really tell that this is a raspberry creme, and it's a true raspberry creme. My camera washed out all hints of blue undertones. Trust me, this is not that red in person! Two easy coats were all I needed, and I didn't have to shake or add thinner to this polish or anything. I can't say for sure that I bought it in 2009, but it was either 2010 or 2011 when I purchased this shade. My point is, that I've owned it for at least 5 years, and I saw no reason to pitch it! Went on smooth, didn't require lots of shaking, brush still works great, cap isn't gummed up, and it's still incredibly pigmented. For my accents, I'm pretty sure I've done something similar before. 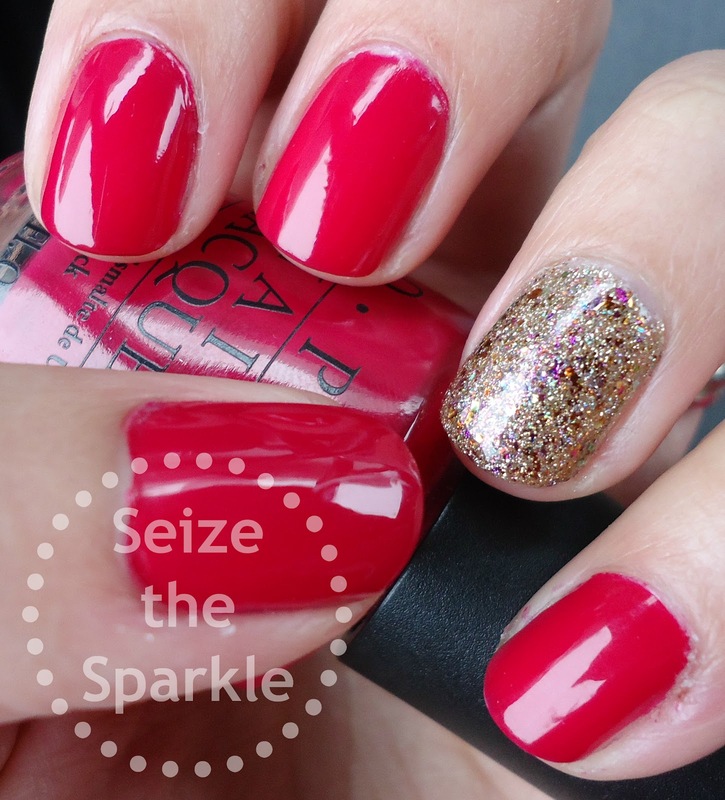 Two coats of Gumdrop Rooftop over Zoya Tomoko add a little bit of interest and aid in smoothing out the textured gold glitter. I really need to find something similar in a super bright silver. I'm loving the shade of silver in Takko Lacquer Salient, but I missed the restock. Booooo. Oddly enough, I haven't really been swooning feverishly over many polishes these days. We're kind of in that lull period between Holiday releases and Spring/Summer collections. I'm getting back into the bright polishes, but I'm also still enjoying vampy shades. 'Tis almost the season for red, pink, white, and hearts all over everything, but I'm a little meh this year when it comes to Valentine's Day. Mostly, I'm just ready for warm weather to come and send the dry skin/hangnail train on its way! I've had so many in the past few weeks, it's like a different finger every day! What about you... how are you handling the cold? What colors are creeping into your polish routine? Let me know in the comments!